Simple perfection: Roasted Mushrooms with garlic butter, finished with a fresh squeeze of lemon and thyme leaves. Make this with button mushrooms or large mushrooms! Quick and easy mushroom side dish that pairs with everything from steaks to Roast Chicken, or make a meal out of it as I do! Mushrooms are one of my all time favourite vegetables. I love the savoury flavour, and how versatile they are. From Mushroom Rice to Mushrooms on Toast, in pies, pasta, and an amazing creamy Mushroom Sauce you’ll want to put on everything, mushrooms are terrific as the hero in a dish or to add extra flavour. In fact, if I had to choose one vegetable to live on forever, I’m pretty sure it would be mushrooms. That’s how much I love them. 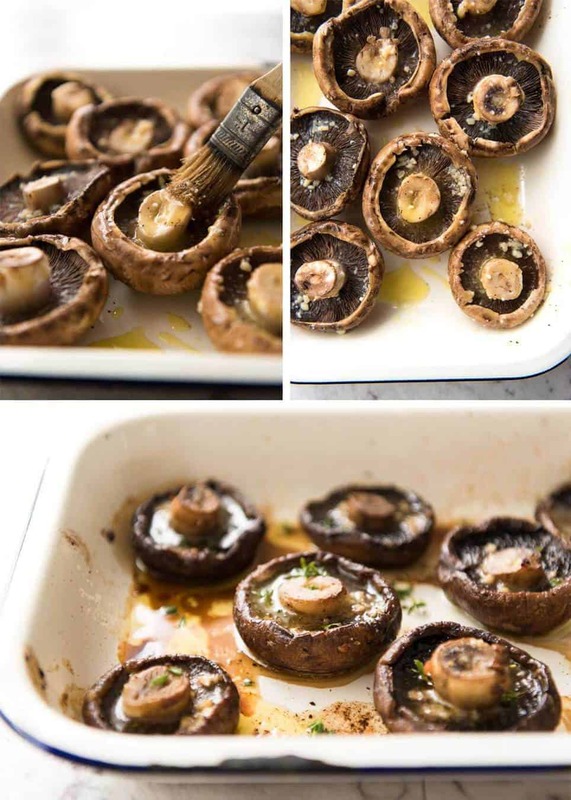 And this is one of my favourite quick and easy ways to cook mushrooms – roasting them in garlic butter. Roasted Mushrooms = juices for drizzling! Both sautéed and roasted mushrooms are equally delicious but there’s one big difference between roasting and pan frying – the pan juices. 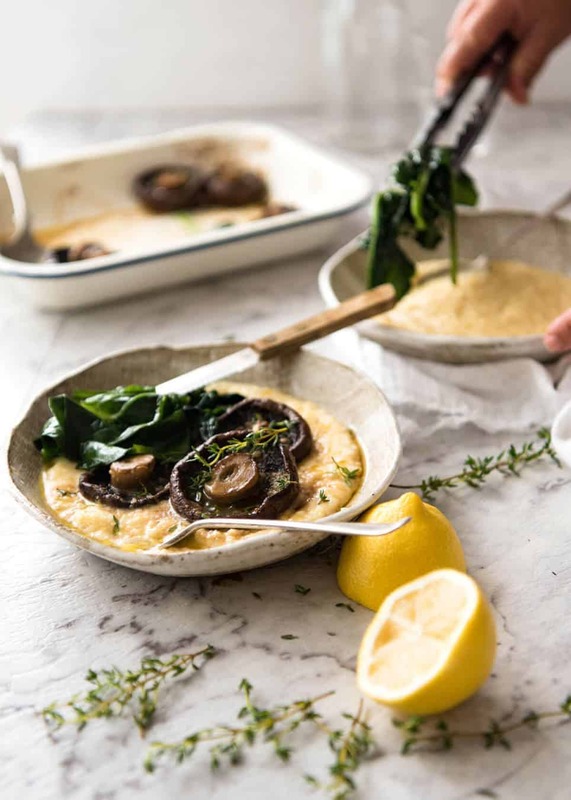 When you roast mushrooms, they essentially create their own buttery sauce that you use to drizzle over the mushrooms when serving. 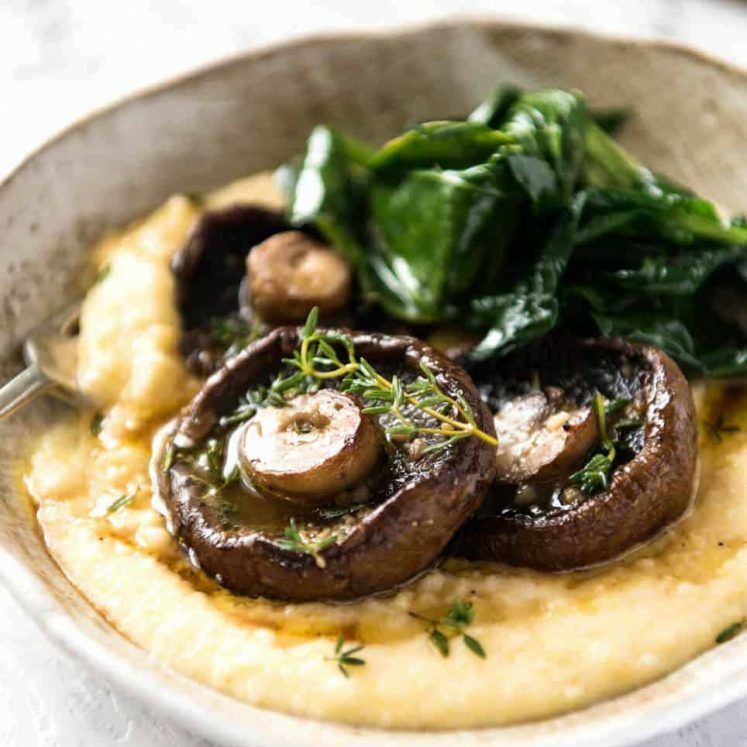 These pan juices are a combination of both the butter and oil drizzled on the mushrooms plus the juices from the mushrooms. Mushrooms are actually packed with an astonishing amount of liquid! On the other hand, if you pan fry the mushrooms on the stove, all the mushroom juices evaporate. They have to, in order to get good colour on the mushrooms. Plus, roasting mushrooms has one other big upside – it’s hands off effortless. No standing over a stove, stirring and turning. Just stick the pan in the oven and walk away! 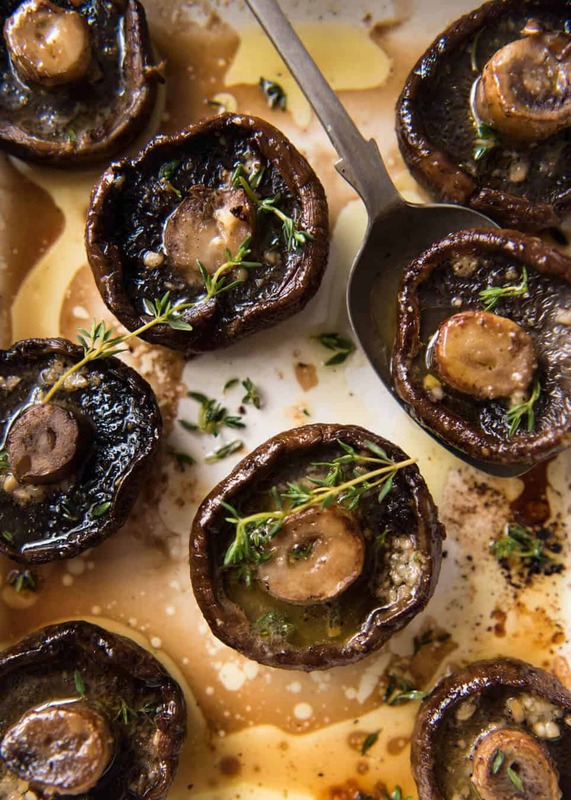 It’s as easy as 1-2-3: Drizzle mushrooms with melted butter mixed with minced garlic, drizzle with oil then roast for 20 to 25 minutes at 200C/400F. If I had my way, I would roast mushrooms in just butter for flavour. But if we used only butter, it would smoke out the oven because the smoke point of butter is too low. So I solve this problem by using a combination of both butter and olive oil. I like to finish with a fresh squeeze of lemon juice to cut through all the buttery goodness, as well as a sprinkle of a fresh herb. Thyme is my favourite – I think it complements mushrooms so well, but parsley and chives are also terrific. 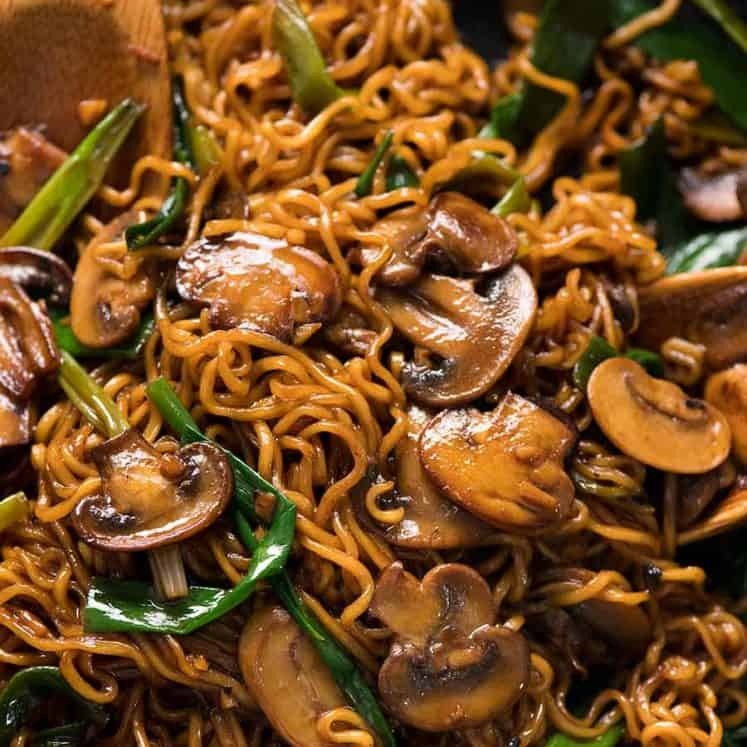 This recipe works just as well with large and small mushrooms. 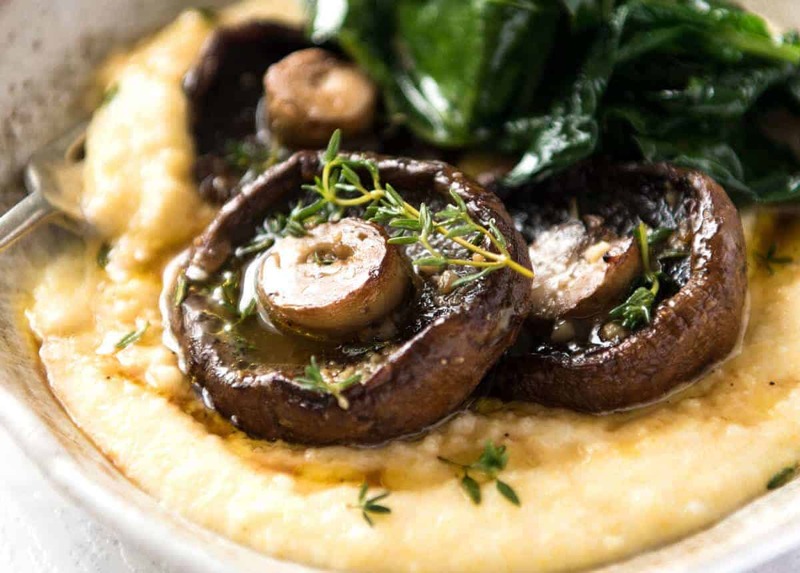 For a meatless meal option, I like to use large mushrooms because it just feels more “meaty”! These Roasted Mushrooms are ideal to serve as a side OR as a main. As a main, I love to place them on creamy mashed potatoes, mashed cauliflower (for a low carb, low cal option), with a side of Curried Rice or on polenta (pictured). It’s pictured in this post with a side of Garlic Sautéed Spinach. When the mushrooms come out of the oven, you’ll see that there’s juices both in the caps of the mushrooms as well as in the pan. The pan juices are liquid gold! It’s garlicky and butter and mushroomy. So transfer the mushrooms to the serving plates carefully to avoid spilling the juices in the mushroom caps, then drizzle with extra juices from the pan. 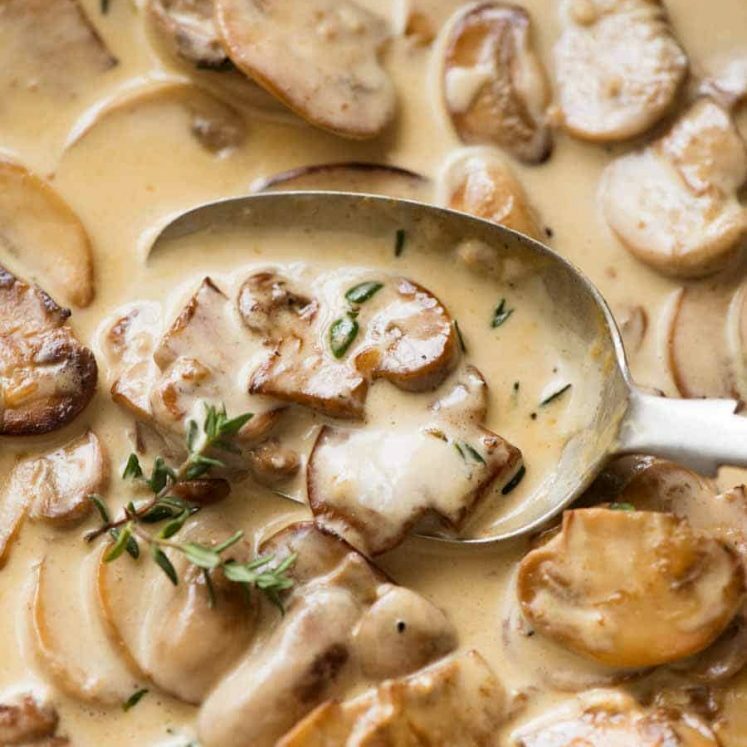 A Creamy Mushroom Sauce you’ll want to put on everything! Garlic Butter Roasted Mushrooms recipe video! Recipe video above. Juicy mushrooms roasted with garlic butter. It's almost self saucing! Make this with large mushrooms, as I have done, or small ones. The addition of olive oil stops the butter from burning and also adds a touch of extra flavour - but the dominant flavour is still butter (and garlic!). Makes 2 generous servings or 3 normal servings as a main, or 4 as a starter. Preheat oven to 200C/390F (standard) or 180C/350F (fan / convection). Place mushrooms cap side down in a medium baking dish (so they are kind of snug - they shrink). Mix butter and garlic in a small bowl. Spoon 1 tsp of butter over each mushroom, then use the rest to brush the edges (or carefully drizzle over edges). Drizzle over olive oil, sprinkle (generously) with salt and pepper. Roast for 20 minutes (tender but still a slight firmness) or 25 minutes (tender). There should be some juices in the pan and plenty pooled in the mushrooms caps. Squeeze over a bit of lemon juice if using, garnish with thyme and parsley. Serve mushrooms, drizzled with pan juices (see notes for serving suggestions). 1. Serving suggestions: Pictured with polenta (I use quick cook) and Garlic Sautéed Spinach, and on toast spread with ricotta. It's also lovely with mashed potato or anything else to soak up all those juices. It doesn't make enough sauce to coat pasta, though you could use a small serving of pasta. 2. This serves 4 as a starter or 2 - 3 as a main. 3. 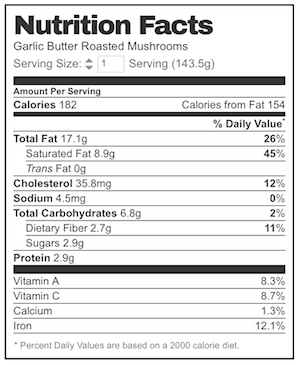 If using small mushrooms, I would add an extra 1 tbsp of butter. 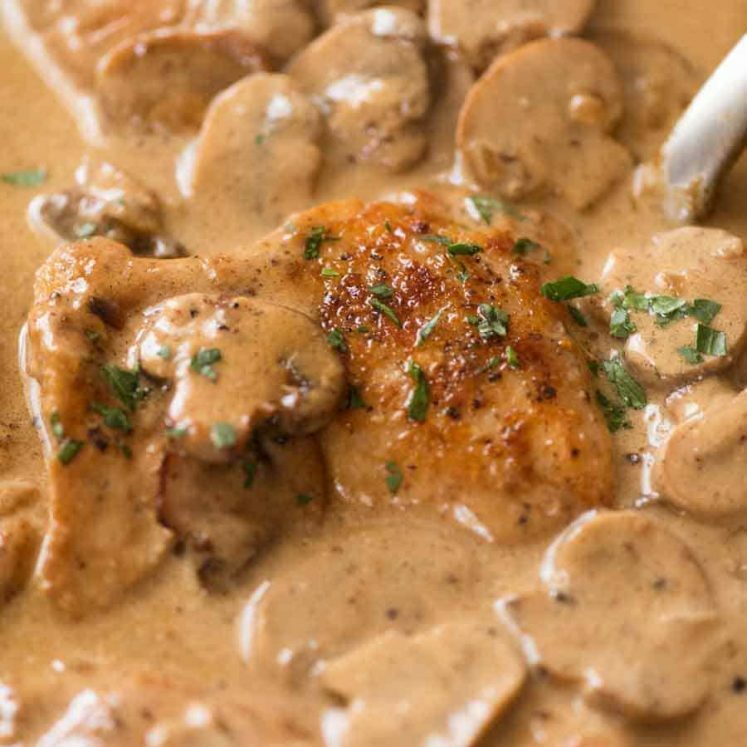 A Mushroom Sauce for Everything! recipe is amazing, but mushrooms cannot be called vegetables, they aren’t even considered plants! Made these for dinner as had leftover mushrooms. Easy, excellent recipe👍! Yessss! So happy you enjoyed it Cindy! Ever since you published this, it has been a go-to for an easy vegetarian option at our house. (Our local mushroom farmers thank you! ) I’ve served it over cannellini mash & have recently started experimenting with throwing other veg into the roast ~ green beans, asparagus, tomatoes, tinkerbell peppers… it’s always delicious & since it’s very self-saucing, I haven’t had to add more butter or oil with the extra veg. Simply fabulous! Can’t wait to hear about your NYC adventures. I moved recently after 20 years there & look forward to visiting vicariously through your posts. Hope you weren’t caught up in the latest subway debacle! Made the baked mushrooms tonight and THEY ARE FABULOUS! Everything worked out perfectly — we are just coming into summery weather here in Northern New York, and I found perfect little rosemary and parsley plants when I went into the grocery store this morning. 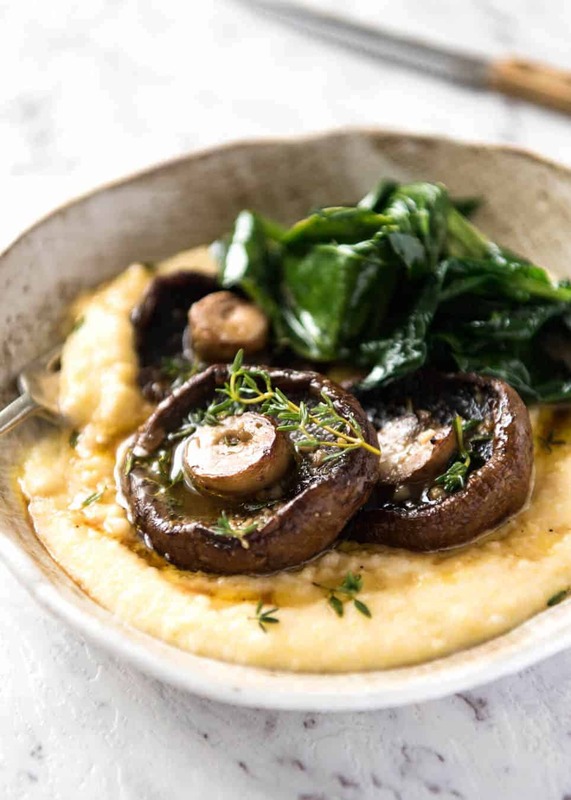 Everybody loved the mushrooms — I served them over polenta and I must say, what a great idea! And Dozer has got to be the most popular dog around the world by now! So adorable!! Daaaang these were sooo goood! Served on polenta. We have a new favorite! Thank you Nagi! Holy smokes, your travel disasters are epic. Cant believe you filled the car with petrol tho, thats silly and OH SO EXPENSIVE. Gahhhhh! Love garlic butter mushies so much, especially on creamy mashed potatoes. YUM! I can’t even….that petrol incident was a DISASTER. I could have bought a new car with the cost to repair it!!! They are shown clearly and precisely. Oh Nagi, I love your ‘bring it on” attitude! And I like your perspective of ‘First World’ problems. Jon and I frequently have some kind of trouble on our vacations but we always come out in the end shining and have something to talk about. Oh I could share some crazy stories!! 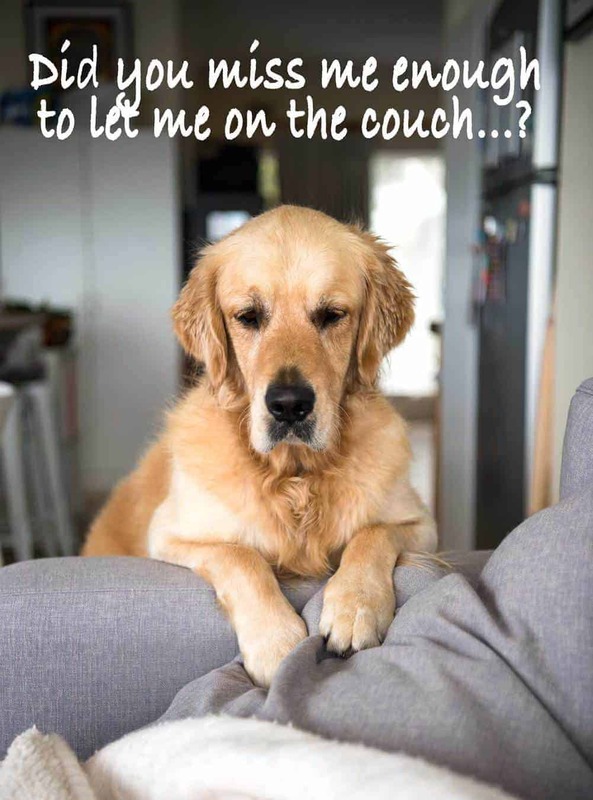 I BET you could!!! But it’s all part of the fun, isn’t it?? 🙂 Some of my wackiest experiences have been on my travels!! I think I forgot to add the rating………you need more than 5 star for your recipes. Hi Nagi. Had to report. Made these tonight…amazing! G grilled ribeye steaks and I also made creamed spinach. Needless to say we are STUFFED and have enough left for another dinner. I was 90F here today with 70% humidity; not ideal. I am tempted to turn on the AC, but we always try to hold off until June 1. Hope things are going well with your house disaster.